While I liked the kind of funky quirkiness of these stubby things, I started thinking of something more elegant that would not take up so much table space and a top easier to grasp with a smaller hand. After a little sketching I tried making what I called my lighthouse design. 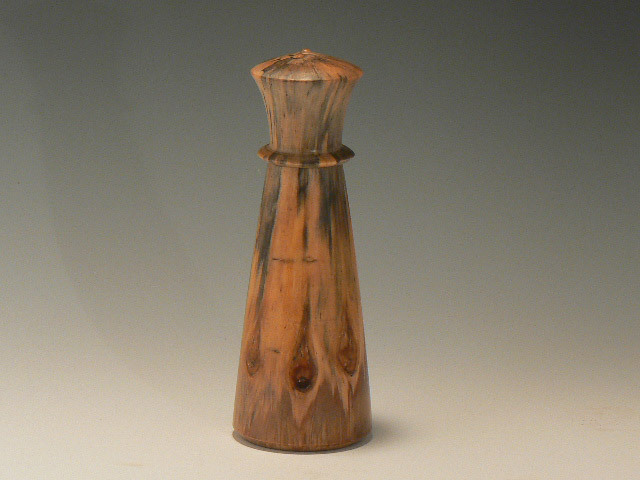 This piece is about 8 inches tall and 2-3/4 inches at its widest point. The join is conveniently below the flange, and the simple shape allows the wood features to be what is seen after the overall shape is taken in. 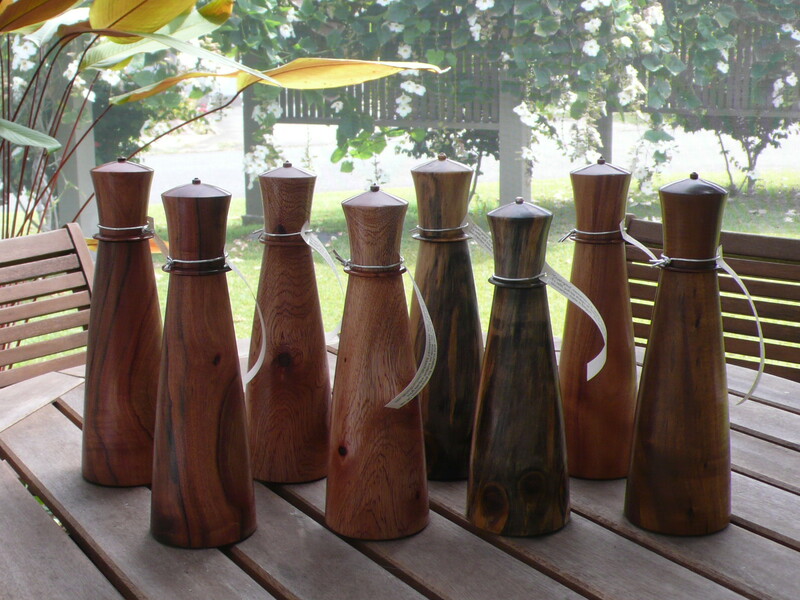 Subsequent pieces have been slight variations–taller, thinner, and so forth, always guided by the eye as they are finished. Many are remounted on the lathe for slight adjustment if the look doesn’t seem right. The flange is sometimes difficult to finish on softwoods like the pines, and when this happens a harder wood compatible in color is glued in place just for the flange. 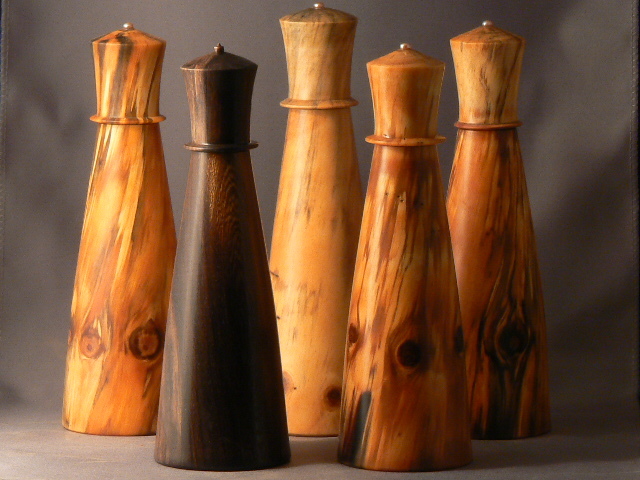 The pith in the pines are very soft, and it is sometimes difficult to come up with a little turned top ornament. In this case, the pith is hardened with thin CA glue, and a small depression is made to glue in a small decorative cabochon. 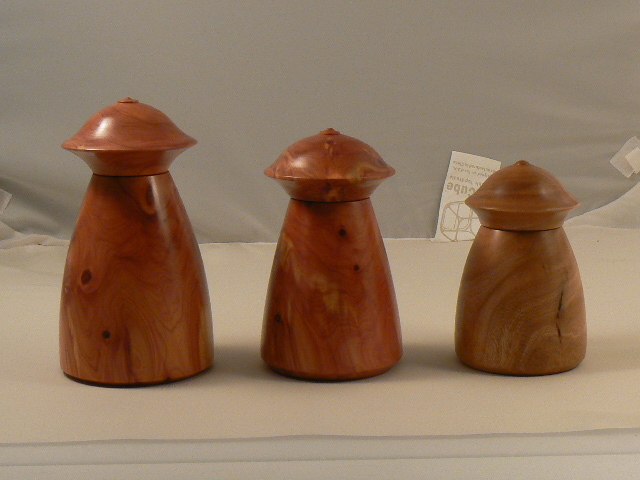 Woods are: (l to r) Norfolk/Cook Pine, Italian Cypress, Koa. Little samples of salt and peppercorns suggest what the mills will accommodate. Woods are (2-ea.) Longan, Allspice, Norfolk/Cook. Woods: Left front is Pheasantwood. 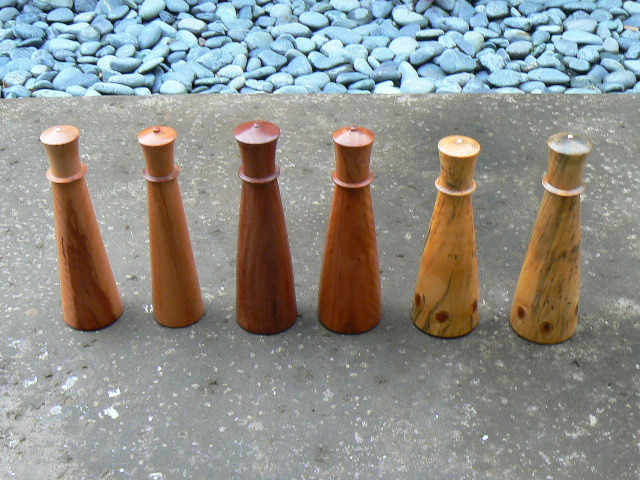 Back middle is from a different tree, either Norfolk or Cook Pine, and the other three are from the same Cook Pine. At this point, the trunk of the Cook Pine was about 5 inches in diameter. 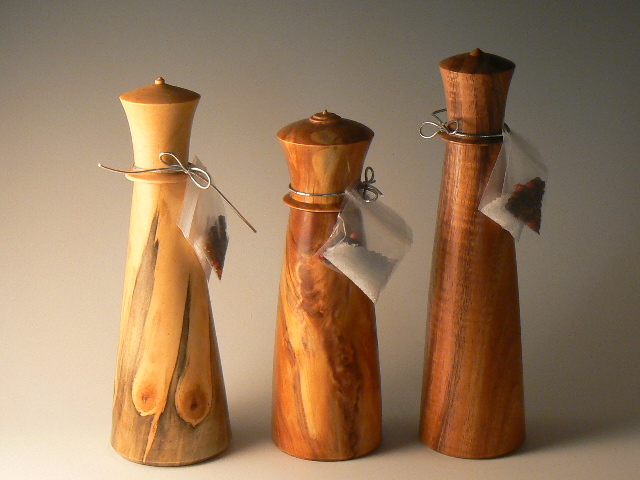 The three Cook Pine mills are a commission from the former owner of the tree that had to be removed. It was becoming a concern, as when the wind made the tree sway, their house also shook. The spalting differs from piece to piece, as the trunk was exposed to weather as a single piece, and the penetration of the moisture came primarily from the cut ends of the piece.